Clyde will observe a minute's silence in memory of former midfielder Chris Mitchell who has died at the age of 27. Mitchell passed away on Friday and he will be remembered before kick-off in Tuesday's League One play-off first leg against Queen's Park at Broadwood. 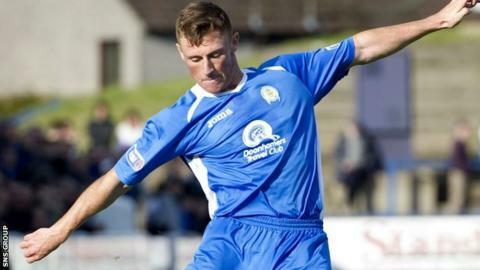 He played for Falkirk, Ayr United, Bradford and Queen of the South before moving to Clyde last summer. Mitchell made 18 appearances for the Bully Wee this season, leaving in January for a new full-time job. "Everyone connected with Clyde FC was shocked and saddened to learn of the death of Chris Mitchell," said the League One hopefuls in a statement. "[Manager] Barry Ferguson, his staff and the players received the news when they were travelling back from Elgin as a group [on Saturday], and are today still coming to terms with the loss." Mitchell spent three seasons at Queen of the South, winning a League One and Challenge Cup double in 2013. "Our condolences and thoughts go out to his family and friends, of which there are many still here at the club," read a statement from Palmerston Park. BBC Radio Scotland pundit Tam McManus wrote on Twitter: "Utterly devastated to hear my former Falkirk and Ayr United team mate Chris Mitchell passed away Friday. Absolute gem of a guy. #RIPMitch"
Mitchell spent the first five years of his career at Falkirk before spending a season with Bradford City. The cause of death has not been disclosed.